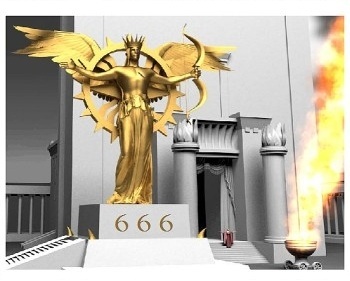 "Daniel 9:26 refers to [the antichrist] as the ruler of the people that will come, meaning that he will be of the royal lineage of the race that destroyed Jerusalem. Historically this was the Roman Empire; therefore he will be predominantly Roman." Lahaye, and other Bible scholars are quick to suggest that the antichrist will come out of Rome based on this one passage in Daniel 9:26. However, further study suggests that the antichrist's nationality is not Roman, but Middle Eastern, and we will look at the scriptures that support that notion. Daniel 2:31-35 - "You, O king, were watching; and behold, a great image! This great image, whose splendor was excellent, stood before you; and its form was awesome. This image's head was of fine gold, its chest and arms of silver, its belly and thighs of bronze, its legs of iron, its feet partly of iron and partly of clay. You watched while a stone was cut out without hands, which struck the image on its feet of iron and clay, and broke them in pieces. Then the iron, the clay, the bronze, the silver, and the gold were crushed together, and became like chaff from the summer threshing floors; the wind carried them away so that no trace of them was found. And the stone that struck the image became a great mountain and filled the whole earth." Daniel 2:36-40 - "This is the dream. Now we will tell the interpretation of it before the king. You, O king, are a king of kings. For the God of heaven has given you a kingdom, power, strength, and glory; and wherever the children of men dwell, or the beasts of the field and the birds of the heaven, He has given them into your hand, and has made you ruler over them all - you are this head of gold. But after you shall arise another kingdom inferior to yours; then another, a third kingdom of bronze, which shall rule over all the earth. And the fourth kingdom shall be as strong as iron, inasmuch as iron breaks in pieces and shatters everything; and like iron that crushes, that kingdom will break in pieces and crush all the others." Historically, the head of gold represents the Babylonian Empire, the chest and arms of silver represent the Medo-Persian Empire, the belly and thighs of bronze represent the Greek Empire, and the legs of iron represent the Roman Empire, as shown to the right. Daniel 2:41-44 - Whereas you saw the feet and toes, partly of potter's clay and partly of iron, the kingdom shall be divided; yet the strength of the iron shall be in it, just as you saw the iron mixed with ceramic clay. And as the toes of the feet were partly of iron and partly of clay, so the kingdom shall be partly strong and partly fragile. As you saw iron mixed with ceramic clay, they will mingle with the seed of men; but they will not adhere to one another, just as iron does not mix with clay. And in the days of these kings the God of heaven will set up a kingdom which shall never be destroyed; and the kingdom shall not be left to other people; it shall break in pieces and consume all these kingdoms, and it shall stand forever. Daniel 9:26 - "And after the sixty-two weeks Messiah shall be cut off, but not for Himself; and the people of the prince who is to come shall destroy the city and the sanctuary. The end of it shall be with a flood, and till the end of the war desolations are determined." Acts 22:25-28 - And as they bound him with thongs, Paul said to the centurion who stood by, "Is it lawful for you to scourge a man who is a Roman, and uncondemned?" When the centurion heard that, he went and told the commander, saying, "Take care what you do, for this man is a Roman." Then the commander came and said to him, "Tell me, are you a Roman?" He said, "Yes." The commander answered, "With a large sum I obtained this citizenship." And Paul said, "But I was born a citizen." "In the Roman Empire, polis citizenship expanded from small scale communities to the entire empire. In the early years of the Roman Republic, citizenship was a prized relationship which was not widely extended. 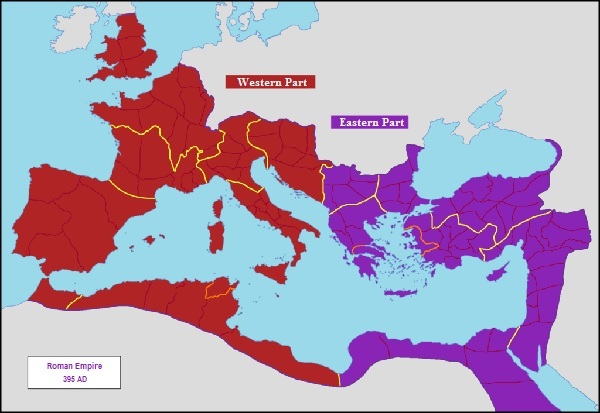 Romans realised that granting citizenship to people from all over the empire legitimized Roman rule over conquered areas. As the centuries went by, citizenship was no longer a status of political agency, but it had been reduced to a judicial safeguard and the expression of rule and law." So we see that Roman citizenship was not confined to Rome, but was granted to different people groups throughout the empire. That being the case, the people who destroyed the city and the sanctuary were Romans, but not necessarily from Rome. In fact, the Roman army typically did not consist of soldiers from Rome, but of people from the various regions, led by Roman Generals, called "legions," and even included non-citizens who could be rewarded Roman citizenship upon completion of their military service (source). This was necessary, because with the massive size of the empire there were not enough soldiers from Rome to go around. In other words, the people who destroyed the temple were under the leadership of the Roman General Titus, but they were probably from the area near Israel. This shows that the antichrist could come from an area in the Middle East. Daniel had a dream about the same four kingdoms as Nebuchadnezzar, but he saw them as four beasts instead of four parts of a statue. As discussed in Revelation 12:3, these four kingdoms are the four horns who exiled the Jewish people from the southern kingdom of Judah (Zechariah 1:18-21). 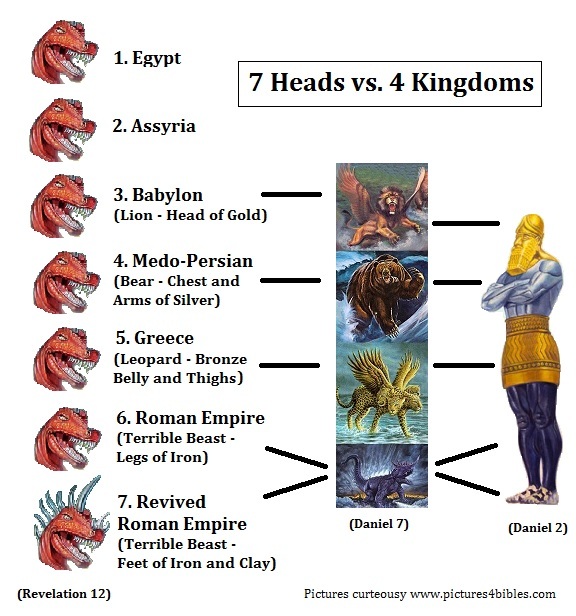 History has shown that these four horns, or kingdoms, are: Babylon (lion), Medo-Persian (bear), Greece (leopard), and Rome (wild, terrible beast). Daniel 7:4-7 - The first was like a lion, and had eagle's wings. I watched till its wings were plucked off; and it was lifted up from the earth and made to stand on two feet like a man, and a man's heart was given to it. "And suddenly another beast, a second, like a bear. It was raised up on one side, and had three ribs in its mouth between its teeth. And they said thus to it: 'Arise, devour much flesh!' "After this I looked, and there was another, like a leopard, which had on its back four wings of a bird. The beast also had four heads, and dominion was given to it. "After this I saw in the night visions, and behold, a fourth beast, dreadful and terrible, exceedingly strong. It had huge iron teeth; it was devouring, breaking in pieces, and trampling the residue with its feet. It was different from all the beasts that were before it, and it had ten horns. Revelation 13:1-2 - Then I stood on the sand of the sea. And I saw a beast rising up out of the sea, having seven heads and ten horns, and on his horns ten crowns, and on his heads a blasphemous name. Now the beast which I saw was like a leopard, his feet were like the feet of a bear, and his mouth like the mouth of a lion. The dragon gave him his power, his throne, and great authority. The beast in John's vision represents both the revived Roman empire and fourth beast in Daniel's dream, and it also represents the antichrist, as later passages describe this beast as a king who rules over the revived kingdom (Revelation 13:4-7, 17:8-14). Since the beast incorporates aspects of the previous kingdoms, then perhaps the lineage of antichrist is somehow tied to all these kingdoms. We will touch more on this later. The two kingdoms in power before Babylon were Egypt and Assyria. The Egyptian Empire extended south through Kush and north through Syria (source). The Assyrian Empire centered on Mesopotamia, or Babylonia around the Tigris and Euphrates rivers (source). Isaiah 52:2-4 - Shake yourself from the dust, arise; sit down, O Jerusalem! Loose yourself from the bonds of your neck, O captive daughter of Zion! For thus says the LORD: "You have sold yourselves for nothing, and you shall be redeemed without money." For thus says the Lord GOD: "My people went down at first Into Egypt to dwell there; then the Assyrian oppressed them without cause. 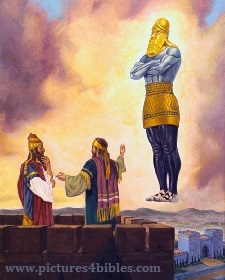 2 Kings 18:11-13 - Then the king of Assyria carried Israel away captive to Assyria, and put them in Halah and by the Habor, the River of Gozan, and in the cities of the Medes, because they did not obey the voice of the LORD their God, but transgressed His covenant and all that Moses the servant of the LORD had commanded; and they would neither hear nor do them. And in the fourteenth year of King Hezekiah, Sennacherib king of Assyria came up against all the fortified cities of Judah and took them. Daniel 9:26-27 - "And after the sixty-two weeks Messiah shall be cut off, but not for Himself; and the people of the prince who is to come shall destroy the city and the sanctuary. The end of it shall be with a flood, and till the end of the war desolations are determined. Then he shall confirm a covenant with many for one week; but in the middle of the week he shall bring an end to sacrifice and offering. And on the wing of abominations shall be one who makes desolate, even until the consummation, which is determined, is poured out on the desolate." Matthew 24:15-16 - "Therefore when you see the 'ABOMINATION OF DESOLATION,' spoken of by Daniel the prophet, standing in the holy place" (whoever reads, let him understand), "then let those who are in Judea flee to the mountains." Mark 13:14 - "So when you see the 'ABOMINATION OF DESOLATION,' spoken of by Daniel the prophet, standing where it ought not" (let the reader understand), "then let those who are in Judea flee to the mountains. Isaiah 10:24-25 - Therefore thus says the Lord GOD of hosts: "O My people, who dwell in Zion, do not be afraid of the Assyrian. He shall strike you with a rod and lift up his staff against you, in the manner of Egypt. For yet a very little while and the indignation will cease, as will My anger in their destruction." Isaiah 14:25-26 - That I will break the Assyrian in My land, and on My mountains tread him underfoot. Then his yoke shall be removed from them, and his burden removed from their shoulders. This is the purpose that is purposed against the whole earth, and this is the hand that is stretched out over all the nations. Micah 5:3-6 - Therefore He shall give them up, until the time that she who is in labor has given birth; then the remnant of His brethren shall return to the children of Israel. And He shall stand and feed His flock in the strength of the LORD, in the majesty of the name of the LORD His God; and they shall abide, for now He shall be great to the ends of the earth; and this One shall be peace. When the Assyrian comes into our land, and when he treads in our palaces, then we will raise against him seven shepherds and eight princely men. They shall waste with the sword the land of Assyria, and the land of Nimrod at its entrances; thus He shall deliver us from the Assyrian, when he comes into our land and when he treads within our borders. Revelation 17:12-13 - "The ten horns which you saw are ten kings who have received no kingdom as yet, but they receive authority for one hour as kings with the beast. These are of one mind, and they will give their power and authority to the beast." Daniel 7:7-8 - "After this I saw in the night visions, and behold, a fourth beast, dreadful and terrible, exceedingly strong. It had huge iron teeth; it was devouring, breaking in pieces, and trampling the residue with its feet. It was different from all the beasts that were before it, and it had ten horns. I was considering the horns, and there was another horn, a little one, coming up among them, before whom three of the first horns were plucked out by the roots. And there, in this horn, were eyes like the eyes of a man, and a mouth speaking pompous words." The modern-day nations conquered by all four kingdoms were Israel, parts of Turkey, Armenia, parts of Egypt, Lebanon, Syria, and Jordan. Therefore, the antichrist will come from the Middle East if it is a region common to all four kingdoms, since the beast has aspects of all four of these kingdoms who exiled the Jews from Israel (Revelation 13:1-2). Incidentally, the lineage in much of the Middle East goes back to Ishmael, the son of Abraham. God did not bless Ishmael, but cursed him and said he would be a wild man with his hand against every man (Genesis 16:12). As we know today, most of Ishmael's descendants in the Middle East are pitted against God's chosen people and the rest of the world under the religion of Islam. And then there was Esau, whose descendants are still prevalent in the Middle East today. Esau despised his birthright and God rejected him in favor of Jacob (Malachi 1:2-3). Then Esau married two Canaanite women and a daughter of Ishmael which upset his parents (Genesis 27-28). Interestingly, Noah cursed Canaan back in Genesis 9:25 for the sin of his father Ham. Ham, Canaan, Ishmael, and Esau are then all tied together in rebellion against God, and He has cursed them all. Satan continues to make their offspring a stumbling block against God's chosen people, and enemies against Israel under the umbrella of Islam. God will judge Islam in the "Great Middle East" and "Gog and Magog" wars. Islam, fundamentally speaking, will cease-to-exist after the first war, as God says he will "reduce to nothing all the gods of the earth" in judgment (Zephaniah 2:11). But someone will emerge to pick up the pieces. The antichrist will confirm a covenant with Israel (Daniel 9:27) and rule over what is today a Muslim region in the Middle East (Daniel 11). Also recall that the beast appears to arise from a region that was part of all the kingdoms who exiled Israel, which suggests He is from the Middle East and of Assyrian lineage. In closing, all the historical and scriptural evidence points to the antichrist coming from the eastern leg of the revived Roman Empire in the Middle East - not Rome.